Minor dispute leads to incitement of gang with iron rods, knives. 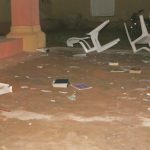 ABUJA, Nigeria (Morning Star News) – A Muslim mob with knives and iron rods injured several members of an Anglican church in Nasarawa state on Aug. 17 over a dispute about less than 1 cent in change, area Christians said. Three pastors, four elders and choir members of the St. James Anglican Cathedral were wounded in Lafia, capital of Nasarawa in central Nigeria, as they met for study and worship preparation. They sustained cuts on their heads and other parts of their bodies when some 30 Muslims attacked with motorcycle chains and wooden clubs, along with the other weapons, area residents said. An area member of the Evangelical Reformed Church of Christ in Lafia, Joshua Nuhu Kuju, told Morning Star News that a Muslim woman incited the Muslims to attack after she had a minor dispute over payment with a young Christian man who runs the church’s water borehole. 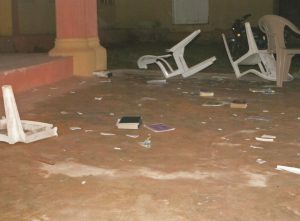 The assailants also damaged Bibles and broke chairs, he said. The Rev. Isaac Onwusongaonye of St. James Anglican Cathedral, of the Church of Nigeria (Anglican Communion), told Morning Star News that at about 6 p.m., as he and six other church leaders were meeting for Bible study preparation and the choir was about to begin rehearsal, a church member informed them that someone was arguing with the young man in charge of the church-run water borehole, Peter Aleku. The girl protested and then told her mother about the exchange, the clergyman said. When the woman’s son arrived, security guards prevented him from entering the church premises at two points – the borehole area and the main gate, Onwusongaonye said. One of the church leaders suggested they report the matter to police, but another suggested they wait for tensions to cool and instead talk with the family the next day, he said. Seriously wounded, the security guards were rushed to the hospital, he said. The clergyman said intervention by police who were told about the attack saved the cathedral from burning down. Police detained the ring-leader’s mother when the gang fled, releasing her only after the family later produced her son. He was arrested, and at press time the case was still under investigation. Many years ago the church had decided to create a water borehole and charge a minimal fee because of the community’s difficulties in securing drinking water, Onwusongaonye said. Established in Lafia in the early 1940s, the church has about 300 members. Nasarawa state is located in Nigeria’s volatile middle belt, west of Plateau state, between the predominantly Muslim north and largely Christian south. Christians make up 51.3 percent of Nigeria’s population of 158.2 million, while Muslims account for 45 percent. Those practicing indigenous religions may be as high as 10 percent of the total population, according to Operation World, so the percentages of Christians and Muslims may be less.